Yesterday Lucy and I went on a Fall adventure with Manna, Aunt Laura, Cousin Taylor and Emma Grace. We all loaded up in my mom's gigantic car which was able to haul all of us around! 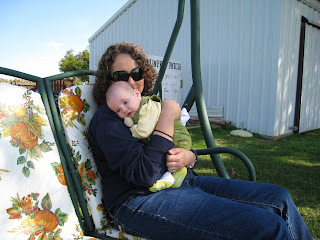 We drove to a local pumpkin patch in Centerton. It was really cute, they had bales of hay laid out with fall mum's and scarecrows for pictures, there was also an old tractor and old horse and buggy. Taylor really enjoyed playing on all of these. 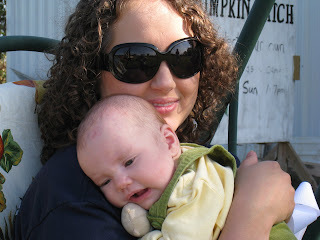 Him and his mom also enjoyed the maze that was set up in a hay field! 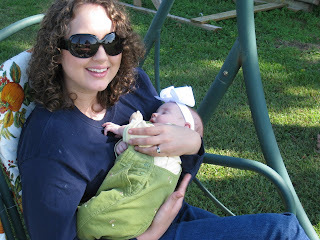 (they got lost atleast three times) Lucy and I enjoyed the weather on a swing, which I used to put her to sleep. 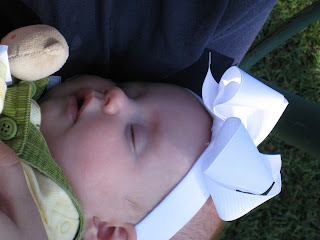 It was really nice just to be outside with Lucy. When we are at home we don't take advantage of the nice weather, we should, but instead we stay inside. (we do try to take stroller walks to help out with the baby weight) Anyway, back to the pumpkin patch... we all had the best time! I hope it can become a tradition!